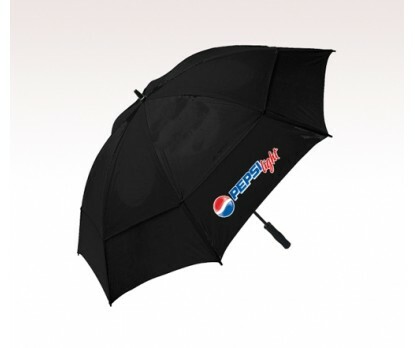 Personalized black 62” arc wind tamer windproof umbrellas are wind tamers by all means. This umbrella helps marketers to withstand high winds of competition with ease by offering its large surface to work upon. Also, it helps a user to withstand high atmospheric winds with its specialized construction. Features –manual open function, black 62” arc double canopy windproof frame (falls back into its original shape when pulled inside out), sturdy fiberglass frame, EVA rubber handle and shaft. Imprint area – 6 ¼” Top X 6” H X 8” W (for upper panel) & 9 ½” Top X 5” H X 12” W.